• Analysis of efficiency of the regulated transportation coach operator by stochastic frontier of Cobb-Douglas and translog functions: the case of the interstate passenger coach transportation in Brazil., by Francisco Giusepe Donato Martins, Francisco Gildemir Ferreira da Silva*, Carlos Henrique Rocha, Marcelo Queiroz, Carlos Eduardo Freire Araújo [paper in English]. 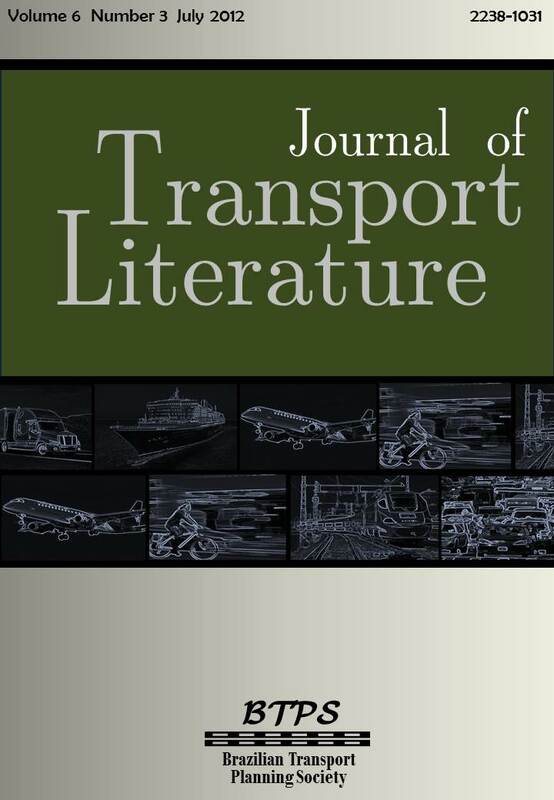 • Regulatory framework of interstate coach passengers and real options, by Carlos Henrique Rocha*, Paulo Augusto P. de Britto [paper in Portuguese]. • Effects of advanced purchase on tickets price variation: the case of the São Paulo metropolitan area, by Marcus Vinícius Nascimento* [paper in Portuguese]. • A model forecast for amazon waterways: web tool to support river transportation, by Nelson Kuwahara*, João Caldas do Lago Neto, Themis da Costa Abensur [paper in Portuguese]. • Analysis of an intermodal model for the outlet of the soy production at the Brazilian Midwest, by Michael Pinheiro da Silva, Lino Guimarães Marujo* [paper in Portuguese]. • Capacity and level of service in the passenger terminal of a regional airport - the case of Ribeirão Preto, by Lígia Gesteira Coelho, Antônio Nélson Rodrigues da Silva*, Antonio Carlos Dinato [paper in Portuguese]. • Is departuring from Congonhas airport more expensive than departuring from Guarulhos airport? An econometric study of airline pricing, by Thiago Vinicius Alves Ueda* [paper in Portuguese]. • Maximizing revenue flight of a network by the method of genetic algorithms, by Marcelo Xavier Guterres*, Henry Gomes de Carvalho, Luiz Biondi Neto, Antonio José da Silva Neto, [paper in Portuguese]. • Model for environmental management of urban transportation systems of magnetic levitation with application of fuzzy theory, by Marcelo Prado Sucena*, Richard Magdalena Stephan [paper in Portuguese]. • Exploratory techniques for locating potential users of urban public transportation, by Víctor Frazão Barreto Alves*, Antônio Nélson Rodrigues da Silva, Peter van der Waerden [paper in Portuguese]. • Asymmetric information and mandatory data disclosure by regulated firms: a case study of air transportation, by Lucia Helena Salgado*, Alessandro V. M. Oliveira [paper in Portuguese]. • The air transport market: policy lessons from a review of the literature, by Claudio A. Agostini* [paper in Spanish].